The only person who can stop you from becoming what God intends you to become is you! You want to be a leader, fulfilled and fully realized, always able to take what life throws at you and stretch beyond the status quo. But for some reason, you never quite get there. You just aren’t living up to your potential, and you don’t know why. 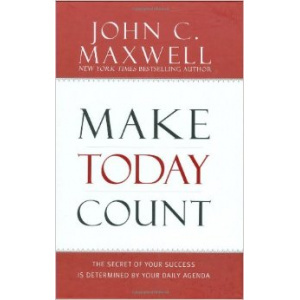 In an easygoing, conversational style, Dr. John Maxwell points out the possibilities within us all and then provides simple game plans for transforming those possibilities into realities. His practical methods of successful living, honed in his own life and ministry, can help you Be All You Can Be. In the Developing the Leader Within You Workbook, John Maxwell examines the differences between leadership styles, outlines specific ways each reader can apply principles for inspiring, motivating, and influencing others. These principles can be used in any organization to foster integrity and self-discipline and bring a positive change. Developing the Leader Within You Workbook also allows readers to discover how to be effective in the highest calling of leadership by understanding the five characteristics that set leader managers apart from run-of-the-mill managers. In this companion to the bestseller, John Maxwell shows readers how to develop the vision, value, influence, and motivation required of successful leaders. Being a leader means working with people, and that’s not always easy! Whether in your office, church, neighborhood, or elsewhere, your interpersonal relationships can make or break you as a leader. That’s why it’s so important to be a “people person” and develop your skills in tapping the most precious resource: people. Loaded with life-changing and enriching principles for interacting positively and powerfully with your family, friends, colleagues, and clients, Be a People Person is certain to help you bring out the best in others – and that’s what effective leadership is all about. Good attitudes on a team do not guarantee its success, but bad attitudes guarantee its ruin. So says New York Times bestselling author and leadership expert John C. Maxwell in this highly practical primer, Attitude. Anyone who has tried to lead people with bad attitudes knows the frustration it can bring. You want to make sure your team is catching the right one! "I want to help you learn how to confidently look the prospect of failure in the eye and move forward anyway," says Maxwell. "Because in life, the question is not if you will have problems, but how you are going to deal with them. Stop failing backward and start failing forward!" A Wall Street Journal bestseller, HOW SUCCESSFUL PEOPLE THINKis the perfect, compact read for today's fast-paced world. America's leadership expert John C. Maxwell will teach you how to be more creative and when to question popular thinking. You'll learn how to capture the big picture while focusing your thinking. You'll find out how to tap into your creative potential, develop shared ideas, and derive lessons from the past to better understand the future. With these eleven keys to more effective thinking, you'll clearly see the path to personal success. Readers will learn how to make decisions on important matters and apply those decisions daily to put them on a path to more successful, productive, and fulfilling lives. DON’T WAIT FOR THAT PROMOTION! START LEADING NOW... RIGHT WHERE YOU ARE! Is it possible to lead well when you’re not the top dog? How about if the person you work for is a bad leader? The answer is a resounding yes! Welcome to The 360° Leader. People who desire to lead from the middle of organizations face unique challenges. And they are often held back by myths that prevent them from developing their influence. Dr. Maxwell, one of the globe’s most trusted leadership mentors, debunks the myths, shows you how to overcome the challenges and teaches you the skills you need to become a 360° leader. If you have found yourself trying to lead from the middle of the organization, as the vast majority of professionals do, then you need Maxwell’s insights. You have a unique opportunity to exercise influence in all directions—up (to the boss), across (among your peers), and down (to those you lead). The good news is that your influence is greater than you know. Practice the disciplines of 360° leadership and the opportunities will be endless... for your organization, for your career, for your life. EVERYONE WANTS TO BE PART OF A WINNING TEAM. Now is your chance to build one! More importantly, Dr. Maxwell helps you to create the right answers, giving you principles and tips to so you can make good decisions and maximize every moment to achieve your dream.